complete and partial dentures. Complete dentures are needed when all of the teeth are missing. Partial dentures are used when some of the natural teeth remain. A partial denture not only fills in the spaces created by missing teeth, it prevents other teeth from shifting. A Complete denture may be either “conventional” or “immediate.” A conventional type is made after the teeth have been removed and the gum tissue has healed, usually taking 4 to 6 weeks. During this time the patient will go without teeth. Immediate dentures are made in advance and immediately placed after the teeth are removed, thus preventing the patient from having to be without teeth during the healing process. 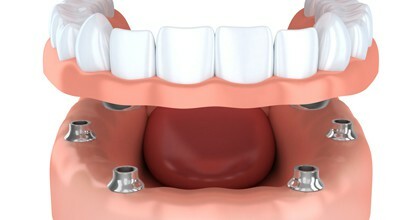 Once the tissues shrink and heal, adjustments and relines of the dentures will have to be made. It is normal to experience increased saliva flow, some soreness, and possible speech and chewing difficulty. This will subside as your muscles and tissues get used to the new dentures. You will be given home care instructions for your new dentures. Proper cleaning of your new dental appliance, good oral hygiene, and regular dental visits will aid in the life of your new dentures.